The room takes its name from its painted wooden ceiling dating from precisely at that time. 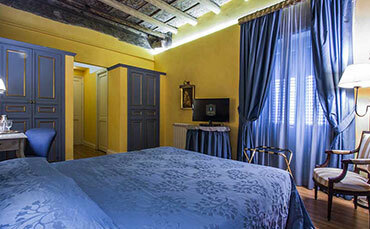 And ‘it furnished with antiques and fine fabrics with blue and gold hues that recall the colors of the house. With a large balcony overlooking the main street, it is equipped with double glazing so as to make it quiet, elegant and full of charm.